"I created a website soliciting crocheters to join me in hand-counterfeiting designer handbags: Fendi, Gucci, Chanel, Prada, etc. Participants troll the internet and choose a design that they particularly covet, working off of low-resolution jpgs which they download. The final results may or may not bear resemblance to the originals, which also interests me. The resulting "translations" are both homages and lumpy mutations. 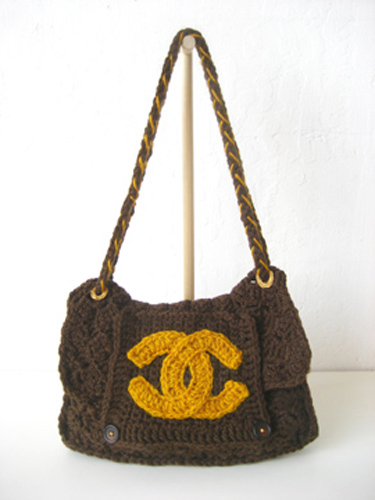 Crochet is considered a lowly medium, and the limitations imposed by trying to create detail with yarn takes advantage of the individual maker's ingenuity and problem-solving skills. I am also interested in how this project can be similar to contemporary manufacturing and distribution channels. As a collaboration it parallels the idea of "outsourcing" labor, but also adds a democratic and perhaps anarchic level of creativity--within the basic framework, participants have taken liberties with their translations, changing colors, adding materials (cardboard, hot glue, etc.) to suit their needs. 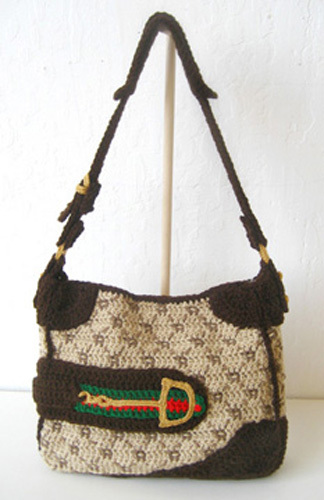 Makers are encouraged to keep and wear their bags, in an attempt to insert strange variants into the stream of commerce and consumption. I ask for people to send me snapshots of their items to share with others. This is an ongoing global project, with makers in from all over the world. Visit the official website for more information, downloadable PDF instructions and images. In 2007 the project travelled to Manila, Beijing, and Istanbul for exhibitions and counterfeiting workshops. In 2008 it was expanded into a free-standing installation/workshop/display area for Yerba Buena Center for the Arts in San Francisco for the exhibition "The Way That We Rhyme: Women, Art & Politics."